Voice Scalable, carrier-grade SIP Trunking for IP-PBX systems. Phone Numbers One of the largest pools of local, toll-free, and vanity numbers in the US and Canada. SMS Next generation SMS capabilities to deliver unique customer interactions. Enterprise / SMB Move your on-premise communications to the cloud with SIP Trunking. Communication Service Providers Innovate faster with our reliable network and industry expertise. Managed Service Providers Grow your business by offering your customers VoIP Solutions powered by Flowroute. Reseller Partners Take advantage of Flowroute's high availability and call quality at discounted rates. Certified Technology Partner Determine if your VoIP solutions are interoperable with Flowroute SIP Trunking. Find a Partner Flowroute partners with communications providers in the U.S. and Canada. During the DeveloperWeek Hackathon, we had the awesome opportunity to work with a number of smart, forward-thinking developers who were looking to creatively integrate calling and messaging capabilities into the apps they were building. The winner of the Flowroute Challenge for Most Innovative Use of SMS was the Mestate app. This app is aimed at disrupting the renting industry by providing a solution to common issues that arise between landlords and tenants, particularly when there is a language barrier. By enabling quick communication through SMS, translation of messages and a platform to fill out forms and pay utilities, this app is providing a one stop solution for people on both sides of the renting process. 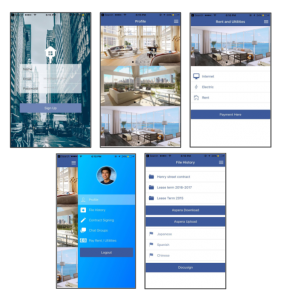 We caught up with the team behind Mestate after the event to learn a little bit more about them and ask them the 11 essential questions to better understand the development of their app and what about this project inspired them. What are your backgrounds in and what brought you together as a team? We thought as a team we would be well rounded since all of our skill sets are strong in different areas. We also all went to UC Davis. Jackie: Computer Science Student from New York City with experience in Finance and Tech management. Studies at UC Davis. Kent: Computer Science Student at UC Davis, with experience in startups. What was your inspiration or thought process for creating the app? Jackie and Kent are currently working on a startup called “Zero Society” (0society.com) which helps student innovators grow their startup by providing a coworking/co-living space. There are many difficulties between tenants and landlords which inspired us to create this app to solve these issues, including background checks, rent, documents. Communication is very important to the success of an app and is the main reason why we turned to Flowroute. What was your technology stack for the project? We utilize Ionic, Aspera Cloud, Flowroute SMS, Google Cloud API, and Python. Do you each have a feature or particular capability that you really wish was included in the app? A money transaction feature with capabilities for charging and paying utilities and rent. How do you think the ability to utilize SMS differentiates or adds value to your app? SMS is still a quick and efficient way for communication, directly to phones, which makes it an ideal communication channel for our app. SMS also was an easy communications platform for us to integrate with our translation services, giving the app the ability to break down language barriers. Anything next on the horizon for the team or the app? We are working on expanding Zero Society to be a nationwide organization to help innovators to grow their startups. We are also considering expanding the Mestate app to be available as a mainstream solution in the real estate industry. Transporter, time machine or cloak of invisibility? I once waited in line for…? Stay tuned for more info about the exciting future of Mestate! If you are interested in learning more about Flowroute’s SMS capabilities go here or if you want to jump right in with our SDKs in PHP, Node.js, Ruby on Rails, Python and .NET, check out our developer portal.